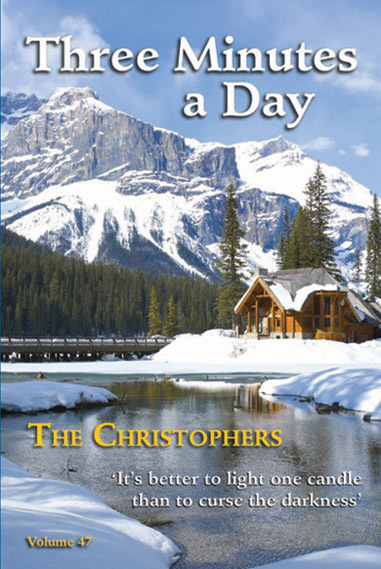 The Christophers’ annual “Three Minutes a Day” book, which is filled with stories and reflections for each day of the year, is more than an ideal source of Christian inspiration for you and your loved ones; it’s also good for you as an individual—and for our culture. One of the entries in the book highlights a recent study conducted by the University of British Columbia. As reported in The Canadian Press, the study’s lead author, Karl Aquino, found there was a “direct link between a person’s exposure to media accounts of extraordinary virtue and their yearning to change the world…If more attention was devoted to recounting stories of uncommon acts of human virtue, the media could have a quantifiable positive effect on the moral behavior of a significant group of people.” If you think about it, the results of the study seem like common sense. The types of stories to which we expose ourselves are bound to have an effect on our minds, hearts, and spirits. And while “Three Minutes a Day” includes numerous spiritual reflections and stories about the impact of ordinary kindnesses, it also presents examples of “uncommon acts of human virtue.” Order a copy of “Three Minutes a Day” for yourself—and for your family and friends as well. It might do you all a world of good.